When life gets busy, one of the first things to go is diet and exercise. You are exhausted and the last thing you want to do is prepare a meal! You end up purchasing a fast-food meal or warming up a quick box-lunch. The thing is, your diet is directly linked to your energy levels, healthy, and general well-being. And going out to eat can become a major source of weight gain, not to mention very expensive! If your goal is to eat healthier, while saving some of your hard-earned money, weekly meal prep is answer! Meal prep may look difficult in the beginning, but it is actually incredibly simple – once you get the hang of it! The goal is to complete it at the beginning of each week, so you don’t have to think about where your next meal is coming from. 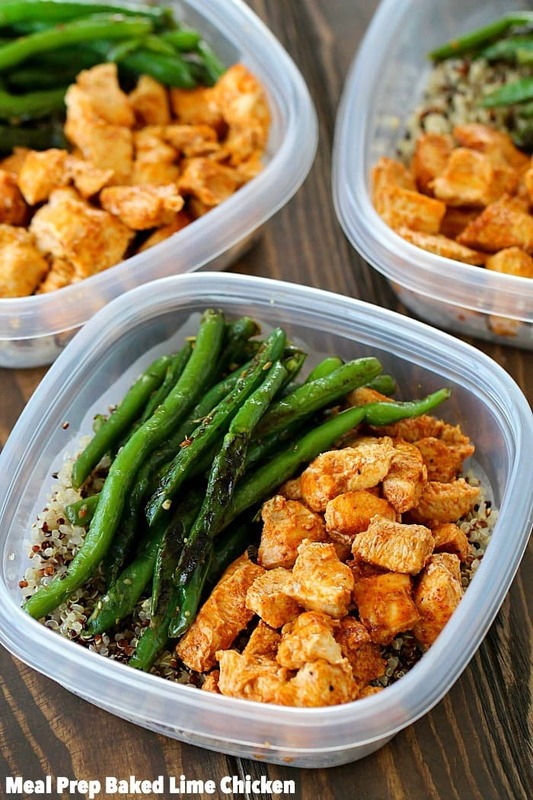 Below are 11 of my favorite meal prep ideas that you can prepare for the whole week! 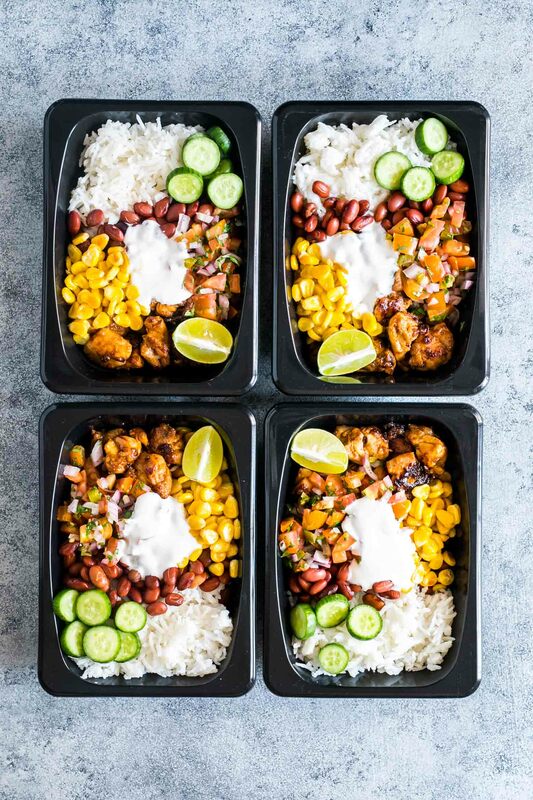 These burrito bowls are the perfect work lunch! The best part is that they take under 30 minutes to make. If you want a lower carb version, you can also turn this into a salad bowl. Just swap the rice out for fresh lettuce! Are you a chronic snacker? I certainly am! This meal prep option can cross as the perfect meal or snack. It is also a healthier alternative to the smaller $7 Bistro Box sold at Starbucks! 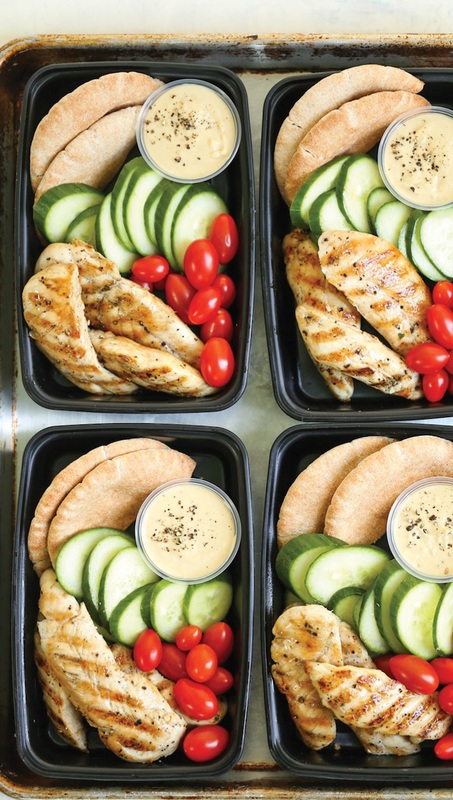 Hummus, chicken strips, cucumber, tomatoes and wheat pita will help to satisfy your snack cravings in the healthiest way possible. If you are a fish-lover, this box lunch is perfect for you! 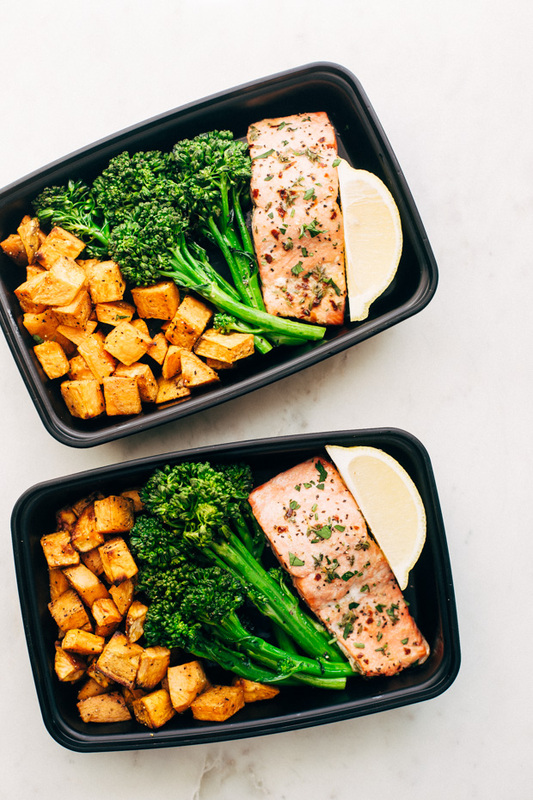 The best part is that you can cook all 3 ingredients (sweet potato, broccoli, and salmon) at the same temperature and at the same time. If you are not a big fan of salmon, you can always swap it out for another fish: haddock, cod, grouper, pollock, etc. This is the easier chili recipe EVER! Please do not overlook how easy and time-saving a pot of soup is! 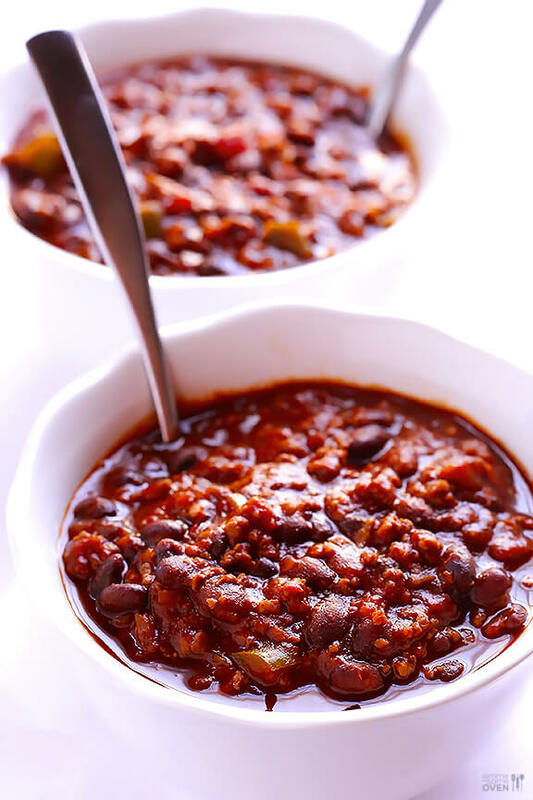 Chili is packed with nutritious, flavorful ingredients that will keep your belly full all day. Cook a pot of soup and dish it into sealed containers to take to work during the week. Pro Tip: Combine these ingredients in your slow cooker and set on low for 8 hours or high for 4 hours. You can even make it in the morning and come home to the delicious aroma of a warm bowl of soup. 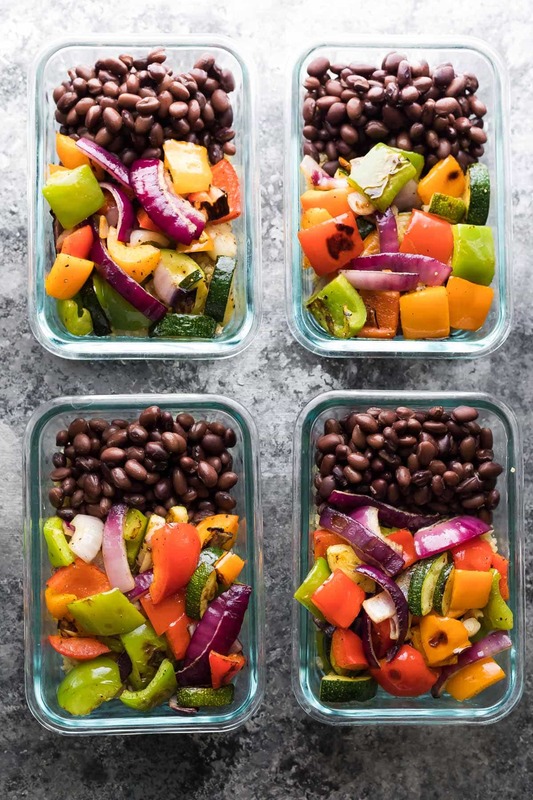 If you are a BBQ fan, this meal prep idea is for you! This hearty and healthy dinner is perfect for meal prepping lunches for work or a quick weekend meal. 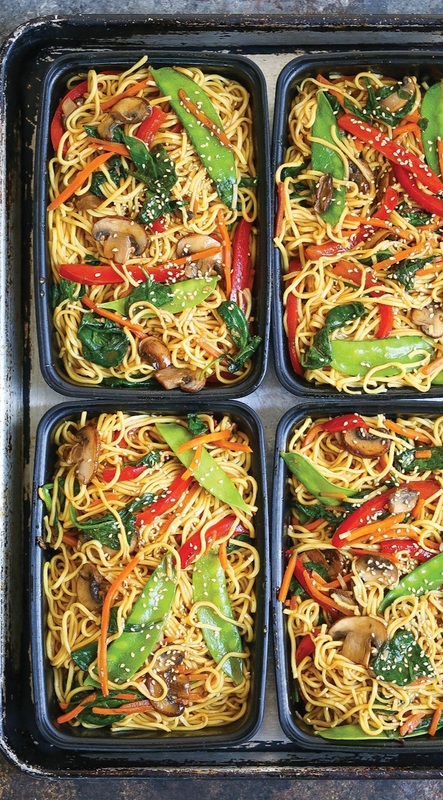 As an added bonus, this is a one-pan meal – meaning less dishes to wash! Who loves Chinese food? I certainly do! The bad part is that it is usually incredibly unhealthy for you. This recipe is made “skinny” with whole wheat spaghetti and a ton of veggies! Caesar salad will always be a crowd favorite! Try this take on a Caesar salad – pasta style. For meal prep, you can cook the pasta ahead of time and store it in a zip-lock bag in the fridge. You can also chop the vegetables ahead of time and store them in the fridge as well. Just remember, if you pour the salad dressing on the lettuce, it won’t taste as delicious a few hours later. I recommend pouring the dressing on the salad prior to eating or simply sprinkling the salad with fresh lettuce at mealtime! Try this healthy take on the Mexican favorite, tacos! 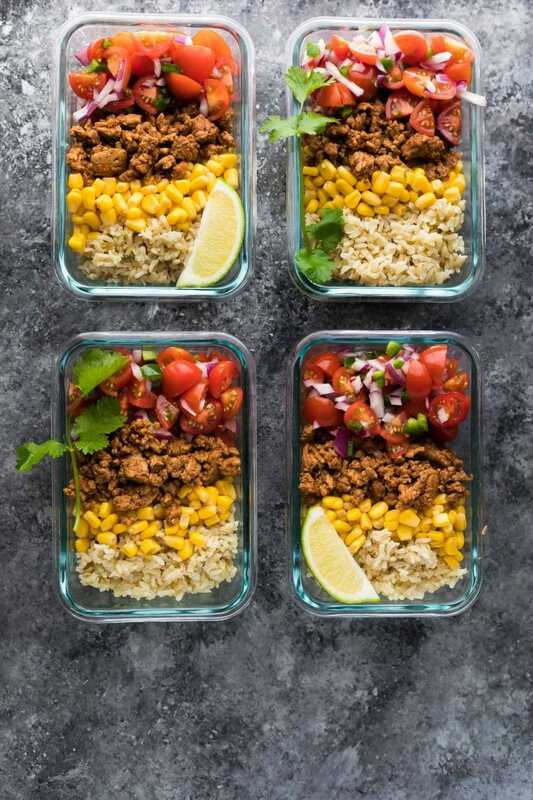 These turkey taco lunch bowls contain the following ingredients: turkey meat, corn, brown rice, and a simple salsa. 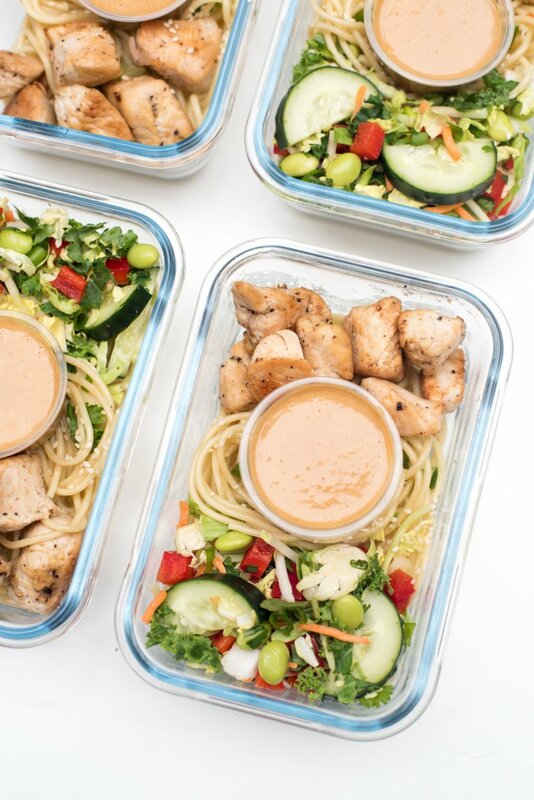 Pack some meal-prep containers at the beginning of the week and enjoy four delicious, nutritional lunches. These Thai bowls are delicious, whether eaten warm or cold! They include a layer of simple sesame noodles topped with some quickly sauteed chicken, fresh and crunchy slaw, and some peanut sauce for dipping. Viola! The perfect grab-and-go meal! You can grille these veggies on the barbecue, stove-top, or in the oven. The black beans can either be cooked in a slow cooker (my favorite way) or simply poured out of a can and thoroughly washed. 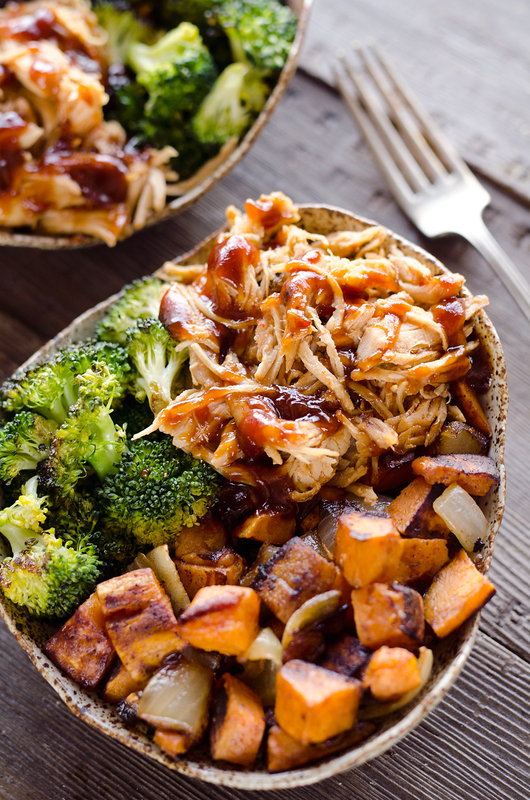 Even thought there is no meat, this food bowl is packed full of protein and nutrients! Did you know that quinoa has been labelled a super-food because it contains all the essential amino acids that you need? 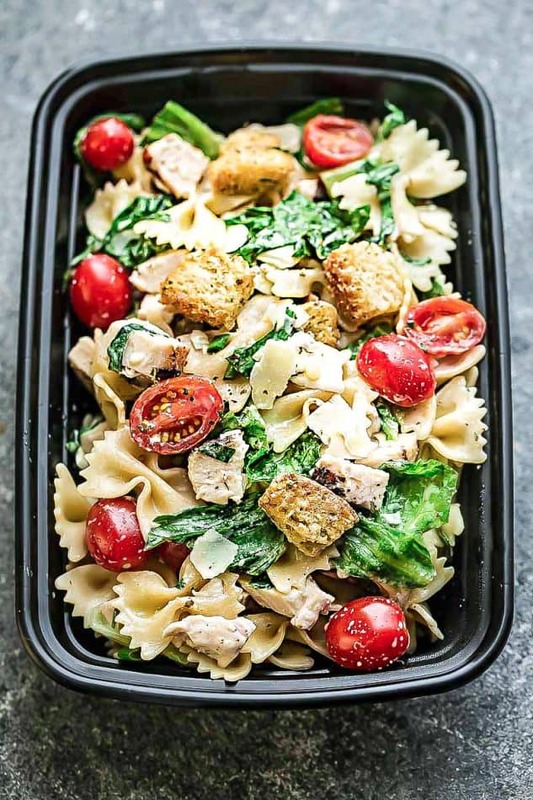 This meal prep bowl is a delicious, protein-packed lunch meal! Pro Tip: Buy a rice cooker! You can pour rice or quinoa into it, add water, and then leave it to cook. It doesn’t get any easier than that! 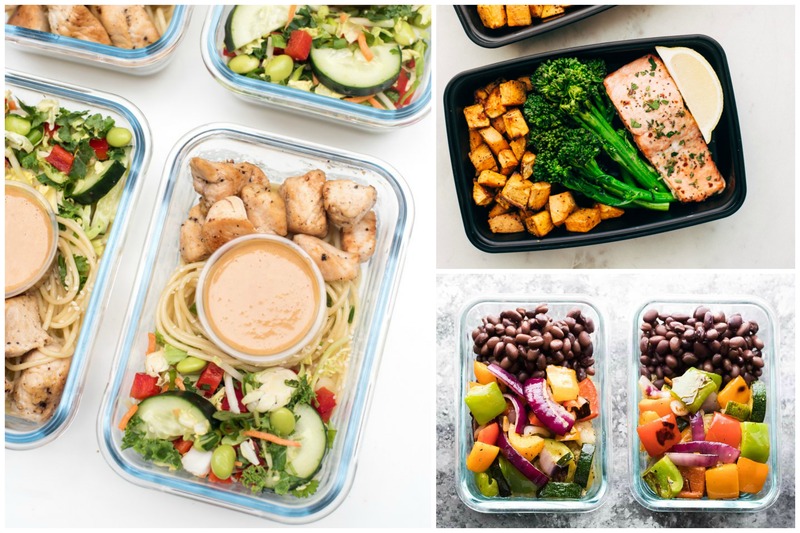 Whether you are cooking for yourself or your family, these meal prep options will save you so much time during the week! If you have a food budget (which you absolutely should), you will be able to track just how much money you will save by meal prepping instead of eating out. Sit down, write out a shopping list, go to the grocery store, and then start building the habit of meal prepping every single weekend. You’ll be able to relax in the evenings instead of worrying about the next day’s meals.